Some of my images (very few) sometimes get confused for HDR image, in the sense of having a Surreal Effect to them. Here are my thoughts on the technique. 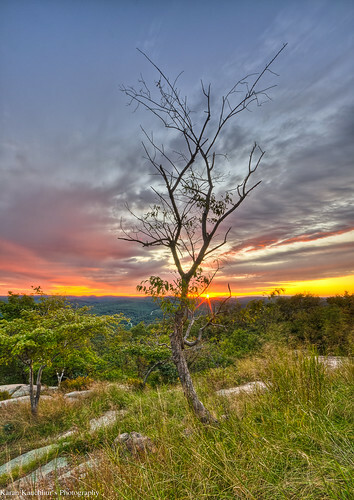 Essentially the concept of HDR is to capture more dynamic range of light. The Camera captures 5 to 6 stops less than what a human eye sees, hence, losing out details, specially in the shadow area. So what the HDR technique helps in acheiving is to merge 2 or more images of different exposures to highlight the shadows clearly. This is a very old concept. After taking a shot the photographer would rewind the film roll to the previous frame and take a shot again. In digital photography you can do that with computers. The Image above has been confused for a HDR. 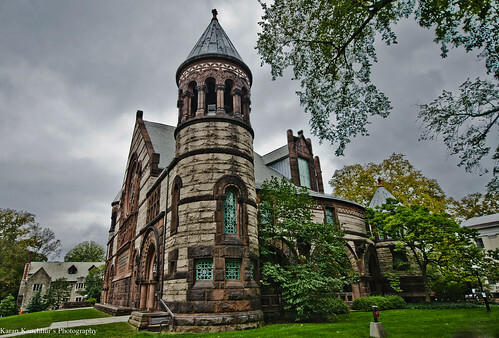 It was shot in Princeton,NJ. The image below was shot in Bear Mt, NY (Appalachian trail). It is an actual HDR. I took two images, the underexposed one was for the shadow and to get that small Sun Burst. The other one was Overexposed for details. It is also an example of how I compensate for not having a good Grad Filter. I generally shoot in natural light, and mostly at sunset or sunrise, and I love bad weather because then clouds add a lot of dramatic effect. I don’t have expensive glass filters, thats why sometimes end up using the HDR technique. 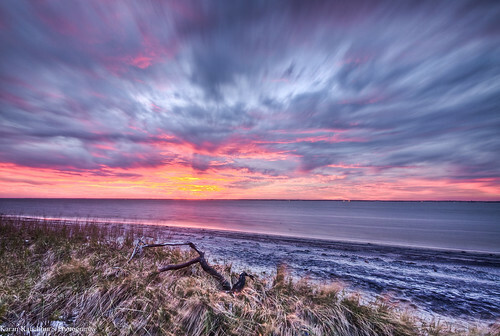 The more popular form of HDR is what you see with the Surreal effect. it makes the Image extraordinary and poster like. I don’t use the surreal effect on the outdoor and landscape images I take. However, it works perfect for indoor shots, giving that very awesome look and feel. 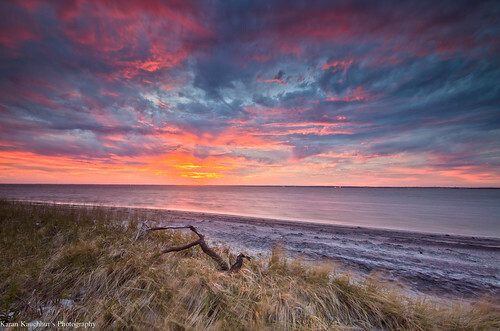 The Image above, shot in Island Beach SP, NJ, is an HDR of two images. The one below is the same image but not an HDR. The one above has that slight surreal effect to it. I personally prefer the non-HDR version. I use Photomatix to merge my images and then process them in lightroom buy adding contrast, tweak the clarity and sharpness. it eventually is a personal choice of how you want your art form to look like. If HDR interests you then may I suggest you have a look at the work of Trey Ratcliff. Also Jay Patel has a free tutorial on Manual HDR technique. Lovely HDRs. I really like the last one. HDR will eventually come to mean the auto-processed ones, such as one using PhotoMatic. I wonder why you suggest Trey Ratcliff? Although Trey has some great photos, most of his photos have this processed HDR look. Your middle image, from Bear Mt, NY (Appalachian trail), have that same processed HDR look – look at the grass and the trees. While in contrast all of Jay’s photo do not suffer from that HDR look. He is one of the best landscape photographer in the world out there now. I refer Trey because he is very popular for HDR imaging. I am not a fan of his. It was just to let people know that if they like the surreal effects they can check his page. My intention here was just to provide my opinion to the reader. I don’t like the surreal effect like how Trey produces, I use HDR for the reasons mentioned in the post. I try to tone it down. Also I compared two images where I was trying to prove that HDR doesnt work for every situation. The whole idea behind HDR is to manage proper light and capture the right details.. specially in the shadows and highlights. Its purely up to the individual how to use it. As far as Jay is concerned.. no argument there. Thanks. I agree, Trey is immensely popular and I also love the composition of his photographs. HDR and other post processing with digital filters that are widely available as push-button option now-a-days can make a not-so-good looking photo to look good. But not many people realize or understand the photographic nuances to make a great photo. HDR processing the way done by Trey ruins majority of his photo but it still has some mass appeal because not many people realize it. For those who understand the basic nuances of photography are going to most likely see that overdone HDR effect and not going to like it. It’s how out human brain works – unless you have seen something your brain filters it out and you don’t see it but once you see it you can’t ignore it anymore. I wish I can ignore that over HDR effect in many of Trey’s pictures and be able to enjoy his photos as he is a prolific photographer and share a lot of photo. Initially I used to like some of his photos but the more I look at more of his photos I started to see that effect more and more that many Photographers talk about what they dislike about the overdone HDR’ish effect. I believe the more people see the overdone HDR photos, they will get tired of it soon. BTW, I liked the rest of the article – very well presented, and I said this elsewhere, you are a great photographer. Love your pictures. please correct PhotoMatic to Photomaix if possible. Completely agree. Initially even I like Trey’s images. They looked so amazing and the colors looked wonderful, but as I started to learn more on photography, specially from Jay and his wife Varina, and a few others that I follow, I started noticing the right from wrong as far as “photography” as an art is concerned. However, right and wrong are subjective, depends on an individuals taste. You are right in that “what’s right and wrong” is subjective. Most of the things are not black and white in life. And when it comes to artistic taste it’s a subjective perception. There is absolutely nothing right or wrong. It’s art. All I am saying is once the human brain is trained to see that overdone HDR effect, it may not going to prefer it anymore. What I disagree is that surrealistic effect that you have mention here (what I call overdone-HDR-effect because it’s no more surrealistic to me 🙂 ) makes the image great or awesome. It does not. If I would not have realized what HDR effect does to photos and seeing it for first time, I might have not noticed much difference and would have liked the first photo. Now that I have processed some of the HDR’s myself and realize this HDR overdone look very well from thousands of photos that I have seen by now, I prefer the second photo over first. Hence, although it made an initial impression it did not last very long for me. As many have said already, this is a subjective topic… but that’s why we have so many styles of music too. Trey’s goal is not to replicate what was actually seen at a location, but the memory/feeling/thoughts about the vantage point (which includes influences from everything else you have seen & experienced throughout your life). For some, it’s overdone,… that’s fine. Some like pop, some like classical. It should be remembered though, that practically every image straight from the camera unprocessed will be ‘blah.’ The camera adds saturation, contrast, and sharpening to the jpgs (and back screen view) right off the bat… and even if using raw, most processing workflow includes these as well. It all comes down to a matter of degree. Where do you want to plant your flag between the unremarkable completely unprocessed raw photo and the super-surrealistic grungy? There is no right or wrong answer…and it also depends on whether it’s for Facebook (Instagram auto-effects = $1billion), your website, printed and framed on the wall, or commercial work. Thank you for your feedback. I wasn’t trying to “hate” on Trey or his style of work. Going by the argument you gave, some like classical some like pop, I don’t like 60-80% of Trey’s work. I do like the fact that he is very well traveled and is very very generous with sharing hos work and letting people use them. I am not For or Against HDR Unreal effects. I use it in many of my images, and i try to keep it toned down as much possible coz thats how I like it, nto coz i hate it. I respect trey for the work he does, he is well know and thats for a good reason. This post was not written to disrespect anyone or any style.